We're happy to offer three items from Nevada, Missouri. Previously they were included on a CD-ROM, but with the modern internet it made sense to discontinue the CD-ROM and offer the three items it contained at a substantial savings to you. 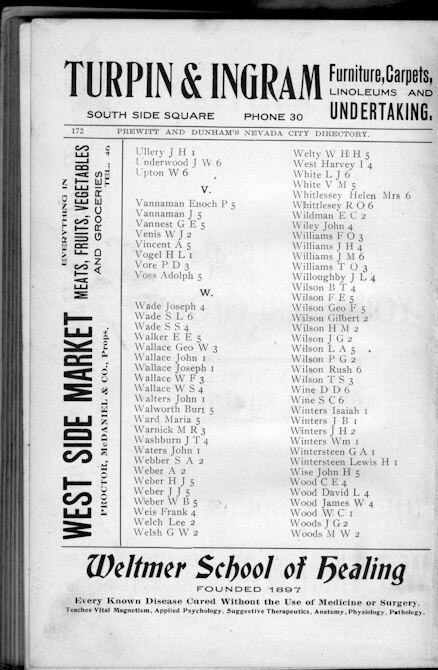 Nevada, Missouri, located in Vernon County, on the Kansas border, between Joplin and Kansas City, was the subject of a city directory in 1905. The historical volume, of around 180 pages, presents a picture of a rather cosmopolitan community on what just a few years earlier had been the frontier. Today, it is an important source document for any historian of the frontier, for local historians interested in western Missouri, and particularly for family historians and genealogists. 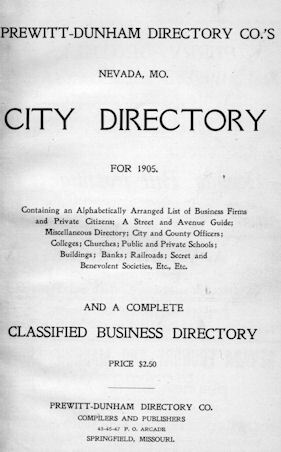 At the time this directory was published, Nevada, MO was the location of Cottey College, a college and conservatory for young women, and also of one of Missouri's largest insane asylums (as well as two private sanitaria). The community was also served by two railroads, at a time in history where rail service was vital to the health of a community. 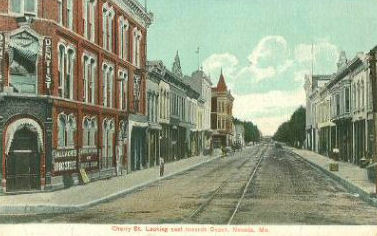 Nevada, in 1905, was clearly an up-and-coming community. For a yearbook this old, the Comet is a remarkable one. It's long for the time -- 137 pages -- and the photography is startlingly good for a yearbook of that era. In a few cases, the photos seem nearly to pop off the page! Pictured are all those you would expect to find, including faculty staff, individual seniors, and class photos for each section of each class from grade 7 through 11. Sports and other extracurriculars also are included -- and photographed. 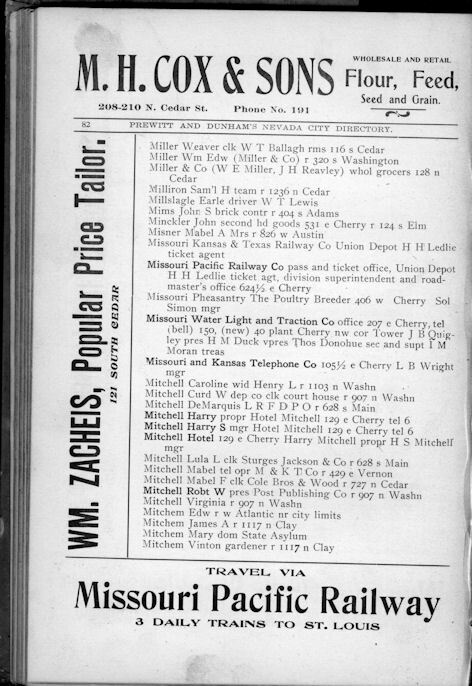 There are also several pages of ads that provide a still different look at Nevada, MO "back then." Finally, we accumulated some old postcards of Nevada, Missouri and surrounding Vernon County in the course of this project. They include the Army camp, Cottey College, and several downtown buildings. Together, they provide a view of an attractive, bustling community circa 1900 -- give or take a few years. The collection is 18 pages long, in PDF format, with two or three images per page. We'll warn you that the postcards were originally created with a stippled finish that didn't scan well, so the resulting photos are not all that we would like to have to offer. However, in case you want to make sure your Nevada, MO collection is complete, we offer them as a "dollar download" -- just $1.00. Return to our main Missouri page. Possibly our affiliate can help?